I have taken a long break from blogging and I think it's time to start it back up again. Over the last two years a lot of things have happened, but the biggest was the loss of my father January 6 of this year. You can see his memorial site here: http://donshiles.com/ His death was long and difficult for all of us and I'm just now beginning to accept that he's really never coming back. I have been extremely active on Goodreads since the last time I blogged and I decided I want to start sharing some of my reviews with you here. 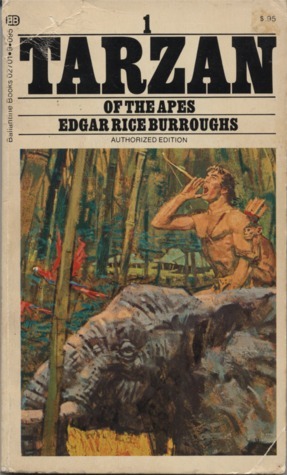 I hope to do other blog posts and I promise to catch you up on the other things that have been happening lately soon, but for now, let me start with my favorite book of all time, Tarzan of the Apes by Edgar Rice Burroughs. Cover on the copy of Tarzan of the Apes that I read. I remember the day in the early to mid 70s that Lois Lew handed me her copy of this book and told me to read it. I devoured it and then read the 20+ other books in the series and then started all over again and read them all twice, and then read the first 5 or 6 about five times more. When I finished that, I started reading everything else written by Edgar Rice Burroughs. I was so captured by his style and stories that it was months before I could force myself to read anything else. I have returned to them again and again and when I sold off and donated almost my entire library before moving across the country 13 years ago Edgar Rice Burroughs was one of only two authors to survive intact. (Georgette Heyer and Anne McCaffrey were the other two.) They now sit proudly in my library, filling half of one shelf running the length of the room. Nevertheless, it had been decades since I had read any ERB book, including Tarzan, so a few years ago I came back to them. I was happy to find that my love of Tarzan had not diminished but I had a hard time feeling the rhythm of the writing. This time around, it all came back to me and I realized I was in for a long, uninterrupted love fest with my favorite superhero of all time, Tarzan of the Apes. I'll see you on the other side.